Its a day or so before the BRDC International Trophy, one of three non-championship F1 races run in Europe that season. Bruce is to have another good weekend, off the back of his Brands Hatch ‘Race Of Champions’ win in March, his teammate and Kiwi buddy Denny Hulme won the prestigious Silverstone race in an emphatic demonstration of the quality of Bruce McLaren and Robin Herd’s F1 design and construction capabilities. 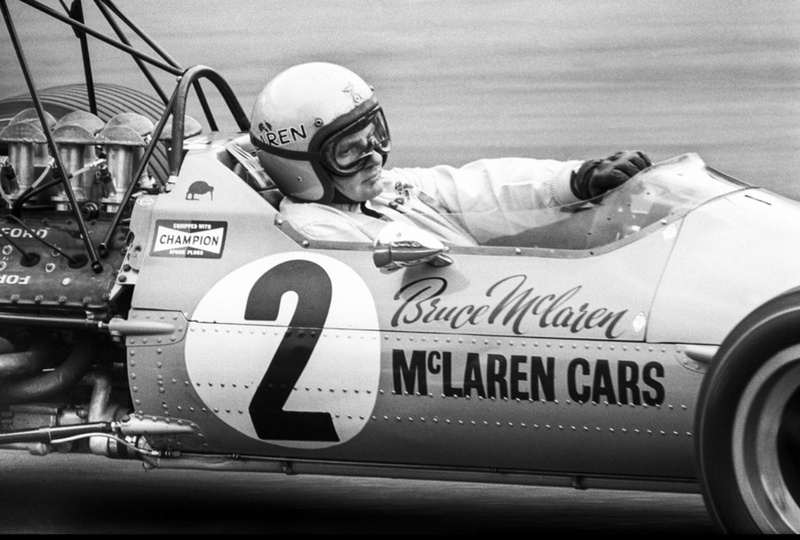 That season Bruce McLaren famously became one of the very few to win a championship GP in a car of his own name and construction when he won the Belgian GP. 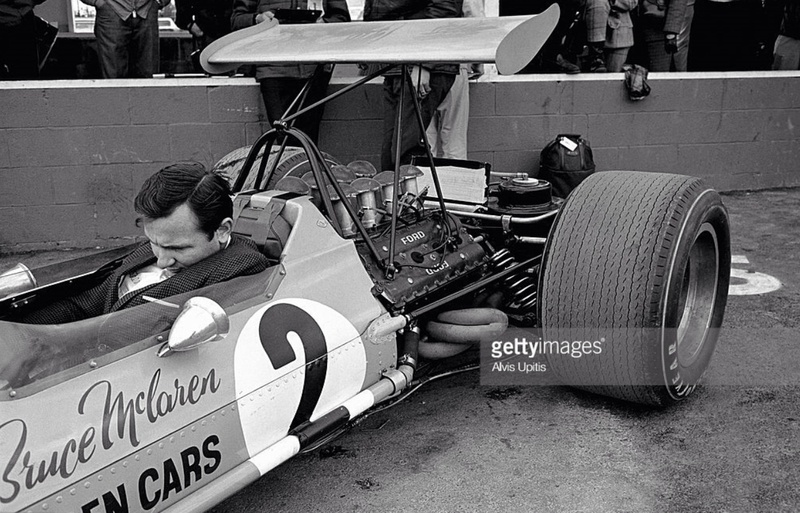 Denny Hulme took another three GP victories and challenged for the 1968 World Championship ultimately won by Graham Hill’s Lotus 49B Ford, the car for which the Ford Cosworth DFV was designed. At the end of 1967 Ford’s Walter Hayes implored Colin Chapman to allow him to offer the DFV to other teams ‘for the good of Grand Prix racing’ such was his fear of Team Lotus dominance. 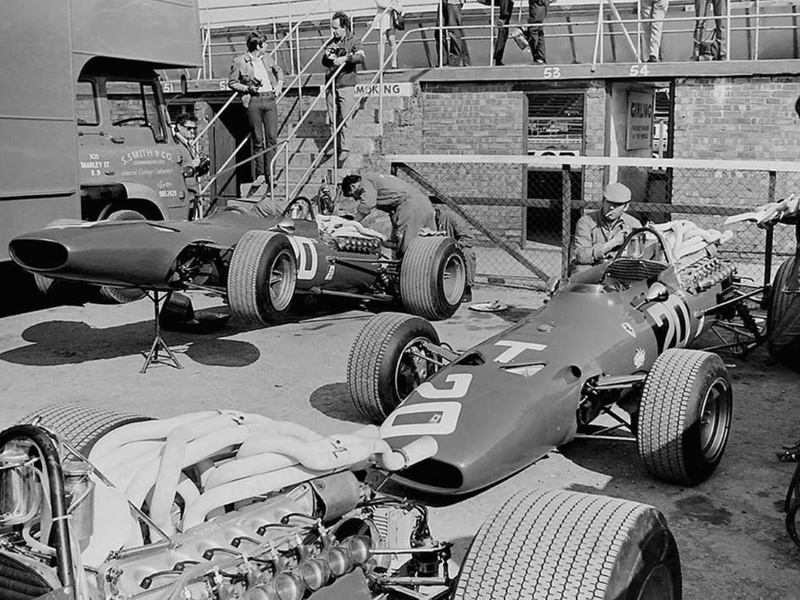 Chapman, to his credit, waived his contractual entitlement to exclusivity- Lotus, Matra and McLaren raced the Ford engine in GP events in 1968. The duo concepted a car which typified the ‘Cosworth Kit Car’ era. A short monocoque chassis ended aft of the driver’s seat and consisted of three steel bulkheads- one at the back, one at the front, and one open bulkhead at the dashboard which was then skinned with aluminium panels to form a full monocoque over the driver’s legs. It was an immensely torsionally rigid and strong structure compared with the very best spaceframes of only a few years before. The M7A used glued and riveted skins of L72 aluminium alloy, a British standard for the aviation industry in a thickness of 22 gauge and in a few places 20 guage magnesium sheet. 40 gallons of fuel were distributed between four rubber bag-tanks- one either side of the driver in the tub, another behind his seat and the fourth in the scuttle. 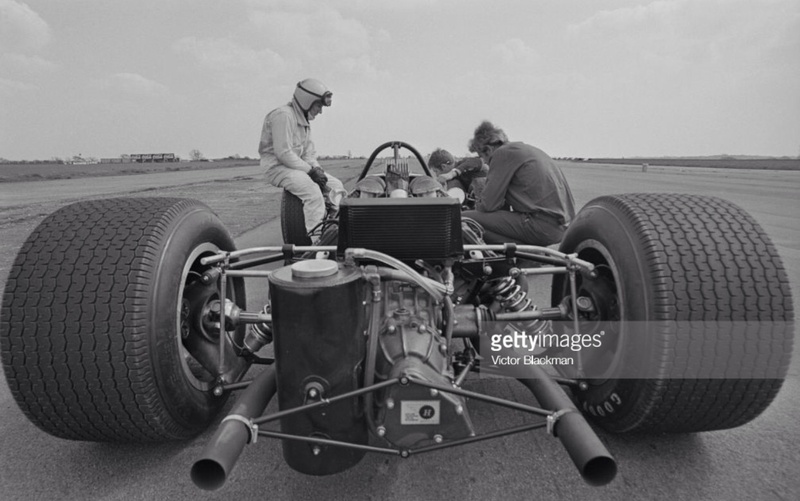 The Cosworth DFV engine was bolted directly to the rear bulkhead and at that stage of its development produced circa 420 bhp @ 9500 rpm. The suspension, of conventional outboard design was derived from the very successful 1967 Can-Am Championship winning M6A Chev. 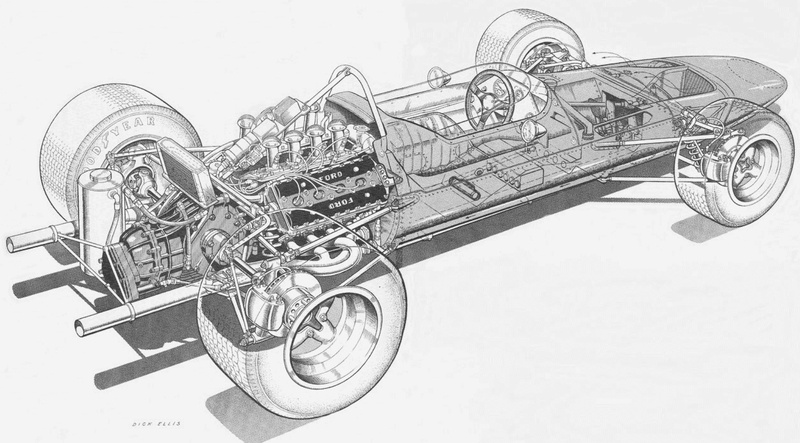 It comprised outboard coil spring/damper units at both ends and single lateral links and trailing arms at the front- and single lateral top links, reversed lower wishbones and twin radius rods at the rear. Uprights were cast magnesium with of course adjustable roll bars front and rear. Steering was McLaren rack and pinion, brakes Lockheed discs all round and the transmission the ubiquitous Hewland DG 300 transaxle five-speed. The radiator was conventionally mounted at the front, with a sleek fibreglass body topping the whole visually arresting package- hot air vented McLaren style out of ‘nostrils’ in the nose with an oil radiator at the rear above the ‘box and clear in the opening shot. 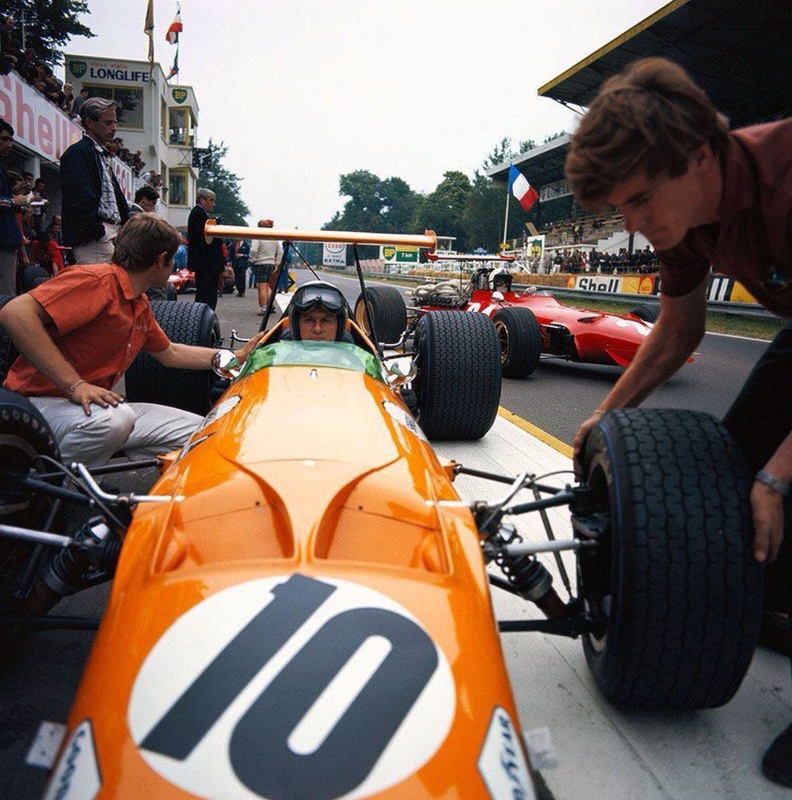 ‘After a poor weekend in Monaco, Bruce McLaren took his team’s first GP victory in the Belgian GP at Spa in June after Jackie Stewart’s Matra MS10 retired on the last lap. 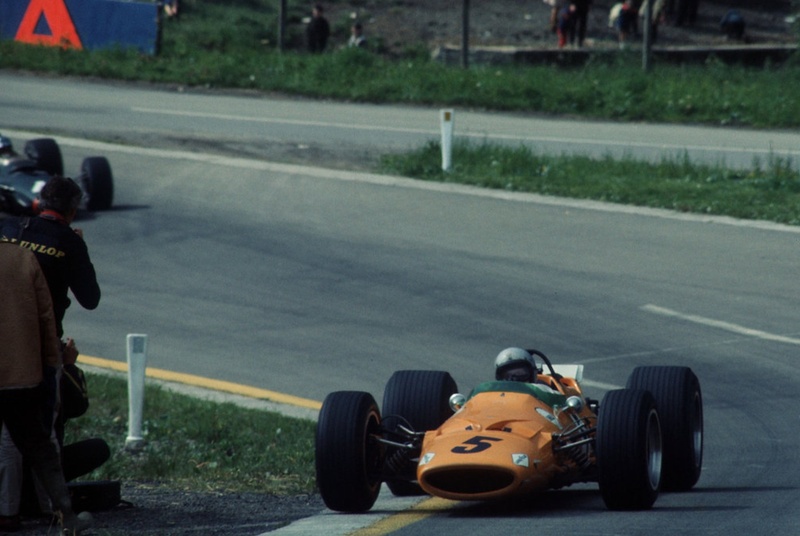 Results were mixed over the next few races, but Hulme won in Italy and in Canada to equal Graham Hill’s score at the top of the World Championship standings. A crash at Watkins Glen and retirement in Mexico ended his challenge, but had been a wonderful season for McLaren’s F1 team’. In terms of the ebbs and flows of the season, in ‘The Year of Wings’, Matra and Ferrari- on Firestone and Dunlop tyres respectively won races later in the season and Lotus set the aerodynamic standard with high-wings after their initial appearance on the Ferrari 312 and Brabham BT26 Repco at Spa. 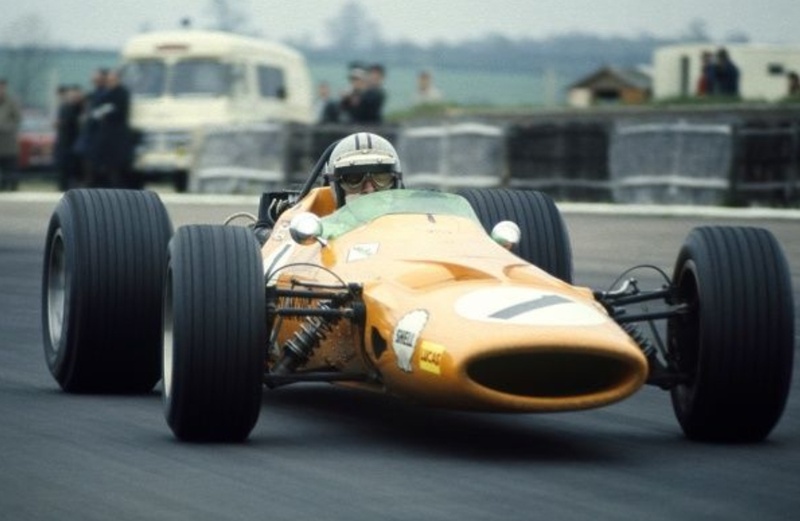 McLaren lost some of their edge- the cars wings were less effective than Lotuses, when they remained attached to their cars, mounted in the middle of the M7A on the cars sprung mass, rather than Lotus 49 style at the rear on the unsprung suspension uprights, and Goodyear too lost their edge. Remember when there was competition between the tyre manufacturers?! Goodyear’s new G9 boots gave Denny the kicker he needed to win at Monza and then at St Jovite, Canada but Graham Hill and Lotus deserved the title in a year during which Hill held the team together and picked everybody up after Jim Clark’s tragic death at Hockenheim in April. 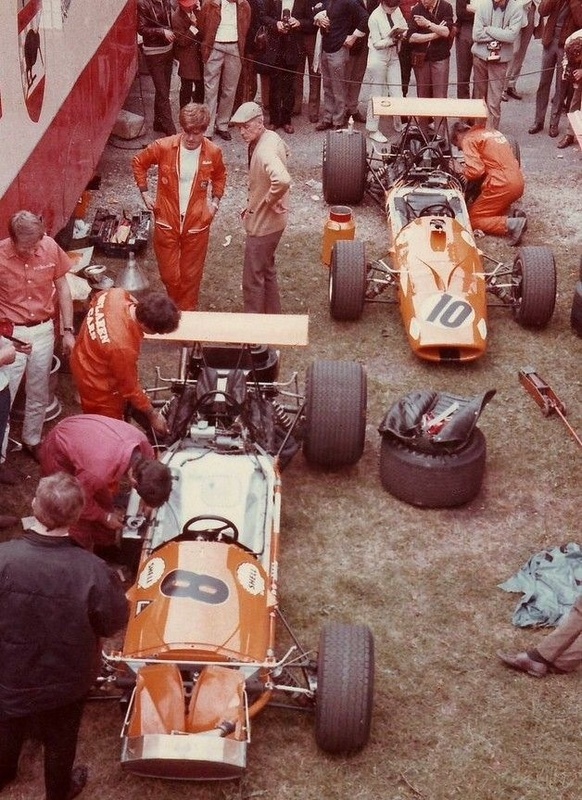 Looking at the M7 design from a commercial perspective, whilst McLaren by this stage were well funded by the standards of the day- the M7 design worked hard in contributing to the companies success by providing the basis of the M14 F1 car and the phenomenally successful M10A and M10B F5000 designs which were the ‘class standard’ from 1969-1971- constructed as they were under licence by Trojan Cars in Croydon. ‘For the 20th B.R.D.C. International Daily Express Trophy race at Silverstone, the Club amassed a small but fairly representative field of Formula One cars. Heading the entry were Hulme and McLaren in the two impeccably-prepared McLaren M7A-Cosworth V8s, which finished first and third in the Race of Champions, and Ferrari sent over two cars, one a new, slightly sleeker-chassised V12 with the engine lower-mounted than hitherto, and the other the car which Amon normally races. Drivers were the young Belgian, Ickx, and Amon, and though the New Zealander tried both cars he decided he preferred his own, and Ickx raced the new one. 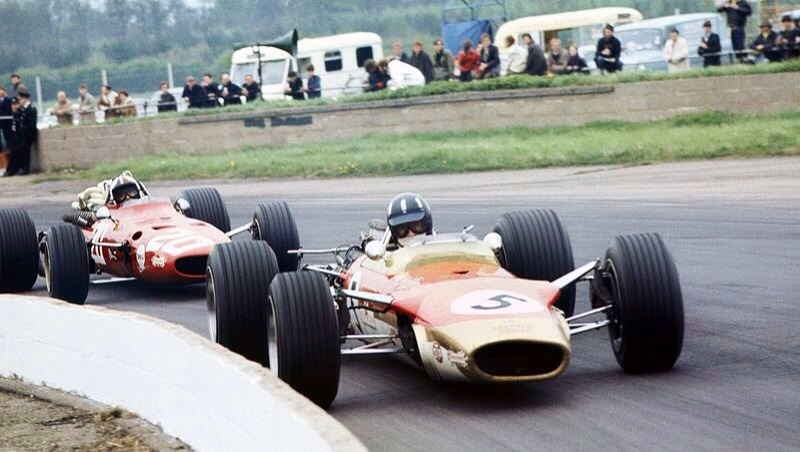 Graham Hill had a solitary Lotus 49-Cosworth V8 which was entered by Gold Leaf Team Lotus, and B.R.M. were well represented with Rodriguez in the Bourne-built, Terry-designed P133 V12 and Spence in the similar, T.A.C.-built P126. Also in a P126 was Courage, having his first F1 race this season for Parnell, and Hobbs had Bernard White’s relatively unsorted Tasman 2-litre B.R.M. P261 chassis, specially lengthened by the works to accommodate the new V12 engine. Also B.R.M.-powered was the lone works Cooper T86B, with Gardner driving, as Scarfiotti was away practicing for the Targa Florio and Redman was reputedly testing F2 Dino Ferraris in Modena. 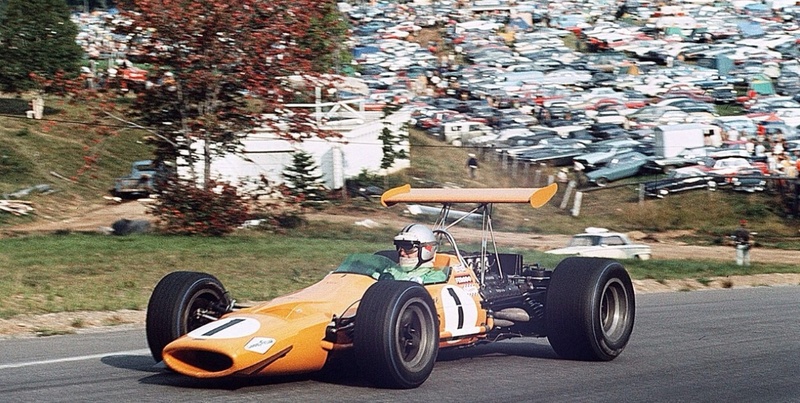 Rob Walker had acquired a new Tasman Lotus 49 chassis to replace the one lost recently in a fire at his Dorking headquarters, Siffert driving as usual; Bonnier was in his 1967 McLaren M5A-B.R.M. V12, and the Swiss Moser had the ex-Hulme, ex-Ligier Brabham BT20-Repco V8. 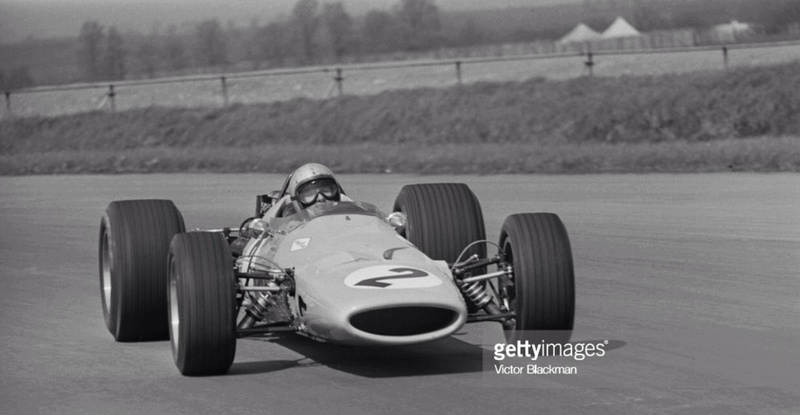 Lanfranchi completed the field in a 2.7-litre Climax 4-cylinder powered Brabham BT23. Withdrawn entries included a second Parnell B.R.M. for Attwood and Sheppard’s Mallite McLaren fitted with a 3-litre version of the original Climax Godiva V8 for Taylor. Two works Brabhams were listed, but were not complete. Last year’s G.P. practice record of 1 min. 25.3 sec. by Clark in the Lotus 49 looked a little sick compared with this year’s speeds, Hulme taking pole position with 1 min. 24.3 sec. to Spence’s 1 min. 24.9 sec., McLaren’s 1 min. 25.1 sec. and Rodriguez’s 1 min. 25.3 sec. Behind these four on the front row came Amon at 1 min. 25.5 sec., Hill 1 min. 25.6 sec., Ickx 1 min. 26.4 sec., and Siffert 1 min. 27.6 sec. After a poignant silence in memory of the late Jim Clark, the field were given a maximum of three warming-up laps, and from the start McLaren took an immediate lead ahead of Spence, Hulme, Rodriguez, Ickx, Hill, Amon, Courage, Bonnier and Gardner. Lap 2 and the leading bunch were all scratching hard to draw out some sort of advantage; Courage was briefly ahead of Amon at Copse and Siffert and Gardner were both by Bonnier, who was being harried by Hobbs. The leading McLarens, B.R.M.s, the lone Lotus and the two Ferraris soon towed each other away from the rest of the field, with Hulme slotting by Spence into second place on lap 4, then being repassed by the B.R.M. Lanfranchi had already stopped for a plug change on his 4-cylinder, and at the start of lap 6 Spence led McLaren into Copse, and was re-passed on the way out to Maggotts to remain the meat in an orange McLaren sandwich for a short distance before chopping by again and leading the bunch on lap 7 from Hulme, McLaren, Rodriguez and Hill, all nose-to-tail. Amon and Ickx had become slightly detached in the works Ferraris, but as they sped down Hangar Straight on that lap a stone was thrown up from Spence’s B.R.M., smashing Hulme’s goggles and giving him a nasty moment which dropped him back to seventh. Almost immediately Rodriguez’s B.R.M. V12 began to misfire, an ignition lead dropping off, and he stopped before Maggotts, replaced the wire and drove on to the pits, where a more lasting repair was made. By lap 9, with Spence leading narrowly from McLaren, Hill was third in the lone Lotus, Amon was a close fourth and Hulme, whose eyes had stopped watering, was already on his tail and looking for a way by. Positions remained unchanged until lap 14, when the Lotus’ V8 engine died, and, seeing a lot of fluid resting in the vee, Hill thought the engine had suffered a serious breakage and had thrown water. In fact, a fuel pipe had split, and the fluid was petrol, but he was out anyway, and walked back to the pits. Hulme had nipped by Amon on this lap, and was going out after Spence, who had been re-passed by McLaren. lckx was falling back in fifth place with the very new and understeering Ferrari, with Siffert some distance behind, followed by Courage, Gardner, Hobbs, Moser, Lanfranchi and then an unhappy Rodriguez in the misfiring B.R.M., last. Next lap Hulme was up into second place, and on lap 20 he passed McLaren after getting round in 1 min. 25.3 sec. to take the lead narrowly from his “number one”, Spence and Amon, and these four were still driving in very close company. But Lanfranchi had retired with bad oil surge, and Siffert’s sixth place evaporated on lap 26 when the clutch broke in the Tasman-chassised Lotus, and two laps previously Gardner had gone out in a trail of smoke and steam when the B.R.M. engine broke a liner. Lap 28, and Spence slotted his slim B.R.M. past McLaren into second place, and as they lapped the tail-enders the leading group began to space out. But Amon closed on McLaren noticeably on lap 36 and was looking for a way by, but then lost time lapping Moser at Copse and dropped back, letting McLaren get away and latch on to Spence’s tail in second place. 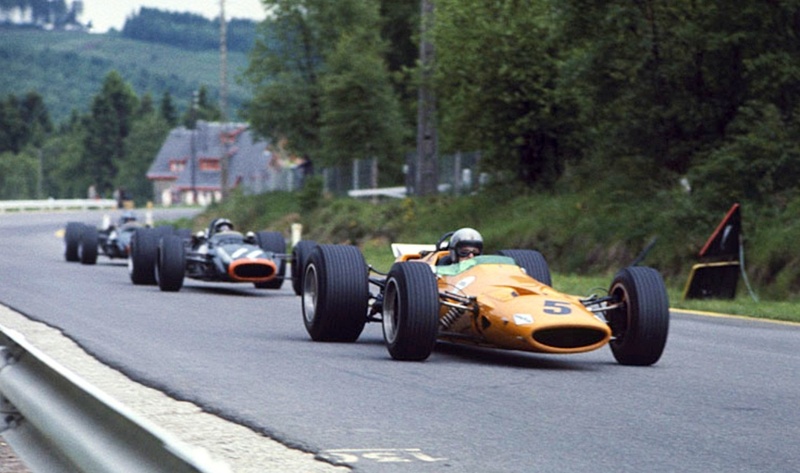 These two then drove very hard, entering corners side-by-side occasionally until lap 41 when the B.R.M.’s engine stopped suddenly at Club with a timing chain breakage, letting McLaren up into second place, but delaying him sufficiently to let Amon catch up in the Ferrari. Rodriguez had finally retired his sick B.R.M., Ickx was running a lonely fourth, with Courage fifth and about to be lapped, while the only other cars still running were Hobbs’ B.R.M. and Moser’s Brabham-Repco. Amon was trying hard to wrest second place from McLaren, setting a new outright circuit record on lap 44 of 1 min. 25.1 sec., 123.82 m.p.h., but Bruce was trying equally hard to stay ahead, doing 1 min. 25.2 sec. on the same lap, and, although the two of them were very close together on lap 45, Amon’s luck was running out and his goggles strap broke. Shielding his eyes from the airstream with one hand he drove for two laps before managing to haul his stand-by pair into position on his face, and this dropped him well back from McLaren, and although closing the gap slightly before the finish he came home in third place. 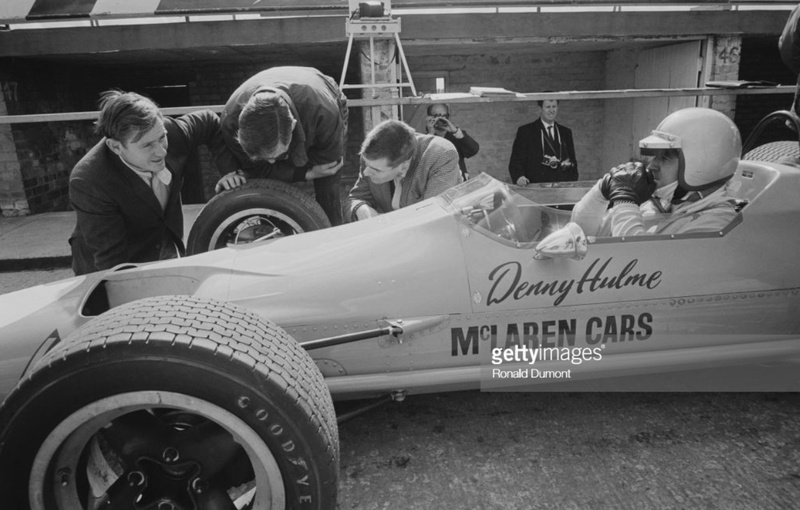 Hulme was battered but triumphant, Bruce McLaren had a lot to smile about with his cars’ first one-two victory, and B.R.M. were well pleased with their turn of speed and not too worried about the frailty their cars had shown since they are still at an early stage in their development. The Ferraris had been rather outpaced from the start, but on a clear track and with McLaren as his target Amon had proved that he is one of the quickest drivers around.’—D. C. N.
That first grid photo, with no wings, and treaded tires alight off the line, makes me miss those days. The second grid photo, with the minute of silence for Jimmy Clark, makes me glad for today’s cars, with all their faults. And it’s not just Jimmy that we lost; a goodly fraction of that field died in race cars. Sorry to get morbid, but . . . The fifties and sixties in particular weren’t good times to be an elite level driver were they? The escalation of speed due to chassis and tyre developments in particular wasn’t matched by changes in the circuits until JYS bravely took the lead. And then we have Ron Dennis and Gordon Murray to thank for the carbon-fibre McLaren MP4- think of the number of drivers who would not have survived accidents of enormous ferocity without the relative safety afforded by that material in the last forty years. Bloody-hell! its nearly forty years since that design! 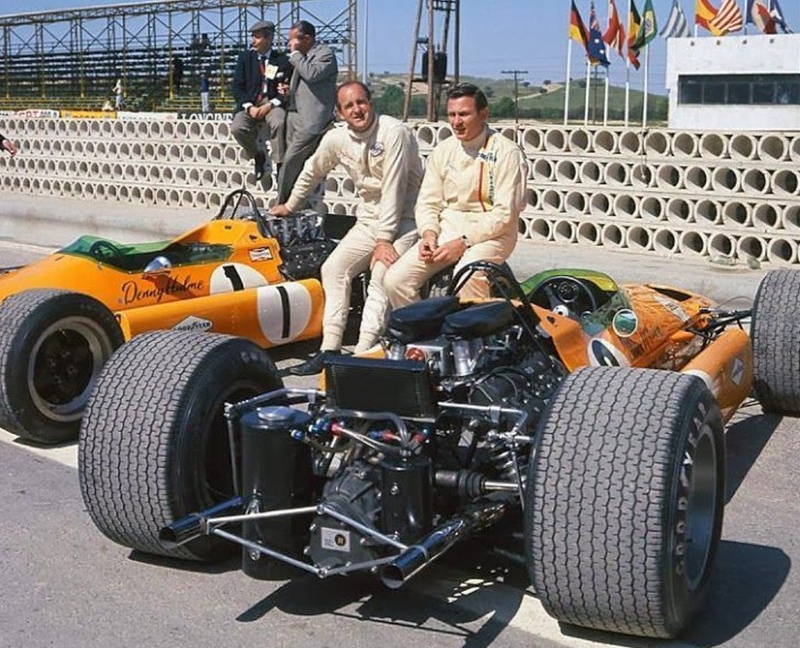 Why were panniers fitted to the McLarens for the 1968 Spanish Grand Prix?